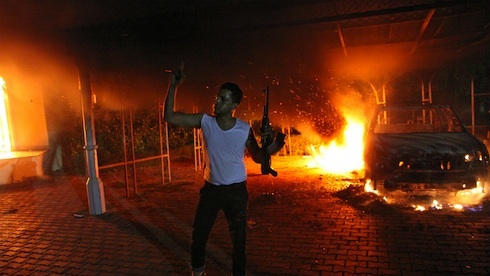 The details of the rioting in Benghazi that killed the US ambassador and sparked the current crisis still remain unclear. What is clear, however, is that the violence is being driven less by religious fury than by political calculation. In Libya, Egypt and elsewhere, the crisis is being fostered by hardline Islamists in an attempt to seize the political initiative in a period of transition and turmoil. The film is almost incidental to this process. The real struggle is not between Muslims and non-Muslims, but between different shades of Islamists, between hardline factions and more mainstream ones. The insurrections that transformed much the Arab world over the past year have created a new terrain for the battle between Muslim factions for political supremacy. But the struggle itself is nothing new. The same tensions fuelled the confrontations over The Satanic Verses and the Danish cartoons. I have long argued that both were primarily political rather than religious conflicts. I am publishing here two edited extracts from my book From Fatwa to Jihad: The Rushdie Affair and its Legacy which describes the development of both conflicts. On 5 October, barely a week after it had been published in Britain, the Indian Ministry of Finance placed The Satanic Verses on its list of proscribed books. 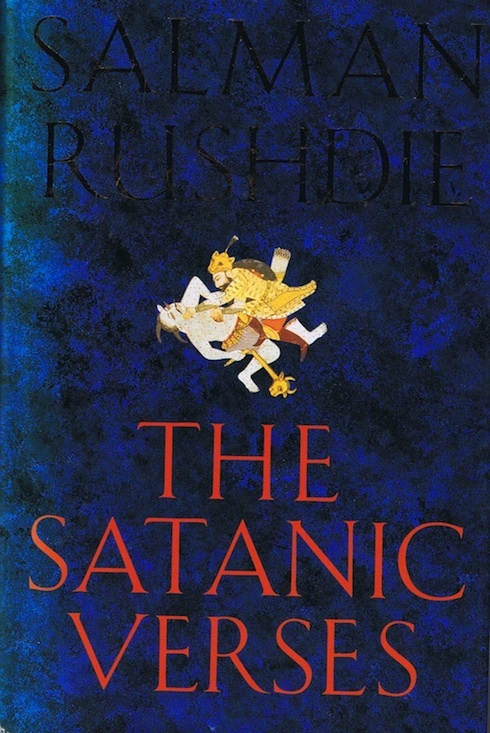 The ban, the ministry proclaimed, ‘did not detract from the literary and artistic merit of Rushdie’s work.’ To which Rushdie sardonically replied, ‘Thanks for the good review’ – while also wondering what the world might make of the fact ‘that it is the Finance Ministry that gets to decide what Indian readers may or may not read.’ The ministry was in fact acting on orders from Prime Minister Ranjiv Gandhi who had been alerted to the issue by a letter from the MP Syed Shahabuddin, a member of the opposition Janata Party, and a self-proclaimed champion of India’s 150-million strong Muslim community. ‘The very title’ of Rushdie’s book, Shahabuddin complained in an article in The Times of India, was ‘suggestively derogatory’… Like virtually all of Rushdie’s opponents, Shahabuddin had not actually read The Satanic Verses. ‘I do not have to wade through a filthy drain to know what filth is’, he retorted. He had been alerted to the novel’s significance by Jamaat-i-Islami activists. Jamaat-i-Islami is an Islamist organisation founded in India in 1941 by Sayyid Abu’l Ala Maududi, one of the heroes of the modern jihadist movement. Rushdie had already taken aim at the Jamaat in his previous novel, Shame. Its response was the campaign against The Satanic Verses. It organised protests and petitioned Indian MPs. With a general election due in November, the result of which was too close to call, no politician was willing to alienate an important Islamic organisation. A ban on The Satanic Verses was inevitable, whether or not anyone had read the book, and whatever its ‘literary and artistic merit’. The Jamaat had a network of organisations in Britain, funded by the Saudi government… The Saudis encouraged a number of Jamaat-influenced organisations in Britain to set up the UK Action Committee on Islamic Affairs (UKACIA) to co-ordinate the campaign against what one UKACIA circular described as ‘the most offensive, filthy and abusive book ever written by any hostile enemy of Islam’. But however overwrought the language, the Jamaati and the Saudis wanted to keep the anti-Rushdie campaign low-key. The Saudis’ style was that of backroom manoeuvrings rather than street protests. They hoped that a combination of diplomatic pressure and financial muscle could suppress The Satanic Verses, just as it had managed to ensure that Death of a Princess, a 1980 TV documentary hostile to the Saudis, was never reshown on British TV. This time the campaign had little success. Penguin refused to withdraw the book and the British government refused to ban it. Even Muslim states seemed barely interested. Few responded to the Saudi campaign or banned the novel. In November Pakistan and South Africa followed India’s lead in proscribing the book and soon after Saudi Arabia, Egypt, Bangladesh, Malaysia and Sudan did so too. But in the majority of Muslim countries, including virtually all Arab states, The Satanic Verses continued to be freely available, even after the Organization of Islamic Conference had, in November, called for a ban. In December – almost three months after the publication of the novel – came the first major street protest in Britain. Seven thousand Muslims marched through Bolton… The demonstration was organised not by the Jamaati but by a rival Islamic faction, the Deobandis. The Jamaati possessed money and political influence, thanks to the Saudi connection, but little support on the ground. The majority of British Muslims were Barelwis, a Sufi-influenced tradition founded in India by Ahmad Raza Khan. Most mosques were run by the Deobandis, another movement founded in nineteenth century British India, with the aim of cleansing Islam and which placed particular stress on Qur’anic study and law… Conflict between the Jamaatis, the Barelwis and the Deobandis was a feature of British Islam, and helped fuel the Rushdie controversy. The Bolton protest was an impressive call to arms. Almost 7000 protestors from across Britain marched through a town with a total Muslim population of around 10,000. 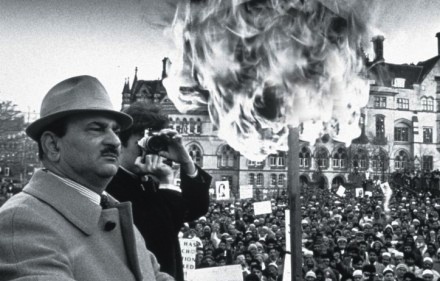 As in Bradford, they carried a copy of The Satanic Verses that they torched – the first time The Satanic Verses had been burnt in anger in Britain. Yet, almost no one took any notice. Whatever the grievances of British Muslims about The Satanic Verses, these had not yet registered on the national radar. The Bradford protest the following month was different, partly because Bradford itself was different… By the 1980s, this small northern town had become the heartbeat of Britain’s Muslim communities. The creation of the Bradford Council of Mosques in 1981, and the close relationship between the mosques – around half of which were controlled by the Deobandis – and Bradford City Council, had provided the town’s imams with considerable political clout. Bradford’s heart also beat strongly to a secular pulse. The Asian Youth Movement, which gave voice to young radical Asians, and was as critical of the mosques as it was of racists, organised strongly in the town. More than a decade of militancy and protest had made Bradford’s Muslim leaders – religious and secular – politically astute and media savvy. They understood the gospel of Marshall McLuhan as well as the teachings of the Prophet Mohammed. The demonstrators videoed the protest and despatched the images to media outlets across the world. The flames that incinerated The Satanic Verses were fanned into an international controversy. In response to the Deobandi demonstrations the Jamaati organised its own street protests – not in Britain but in Pakistan. Pakistan had already banned the novel. But the Islamic Democratic Alliance, of which the Jamaat-i-Islami was an influential part, had recently lost an election to Benazir Bhutto’s Pakistan People’s Party. ‘Was the agitation really against the book which has not been read in Pakistan, is not for sale in Pakistan’, Bhutto wondered, or ‘was it a protest by those people who lost the election… to try and destabilize the process of democracy?’ The Jamaati organised an anti-Rushdie demonstration on 12 February, targeting neither the British embassy nor the offices of Penguin books, but the American Cultural Centre in Islamabad. An angry Jamaati-led mob, 2000-strong according to some reports, 10,000-strong according to others, tried to storm the Centre shouting ‘Allahu Akhbar’ and ‘American Dogs’. They pulled down the Stars and Stripes flying on top of the building and burnt it, along with an effigy of Salman Rushdie. Eyewitness described the police repeatedly firing into the crowd with semi-automatic rifles and pump-action shotguns. By the end of the day at least five people had been killed and more than a hundred injured – the first fatalities of the Rushdie affair. Leaving aside the question of whether the blasphemies in The Satanic Verses are really more offensive than, say, the attempt to compare the publication of a novel with the Final Solution, Sardar’s claim that all Muslims would see such blasphemies as the ‘annihilation of their cultural identity’ was not borne out by events. The novel had little impact on Muslims in other European countries. There is no evidence that French or German Muslims, on reading the book, imagined, as Sardar did, that ‘this is how… it must feel to be raped’. There was barely a squeak of protest in either country when the novel was published there. In America there was an organised letter campaign aimed at Viking Penguin, and bomb threats against its offices, but no mass protests as in Britain, India or Pakistan. 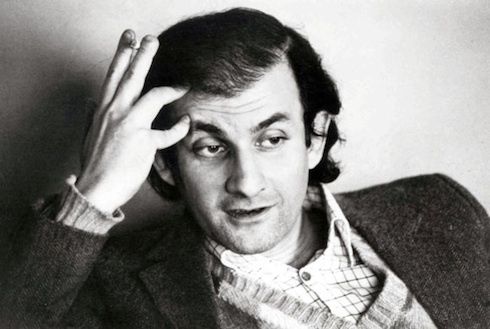 Arabs and Turks, too, seemed as unmoved by Rushdie’s blasphemies as did their European and American brethren. The fatwa transformed the Rushdie affair from a dispute largely confined to Britain and the subcontinent (albeit with considerable Saudi involvement) into a global conflict with historic repercussions, from a quarrel about blasphemy and free speech into a matter of terror and geopolitics. 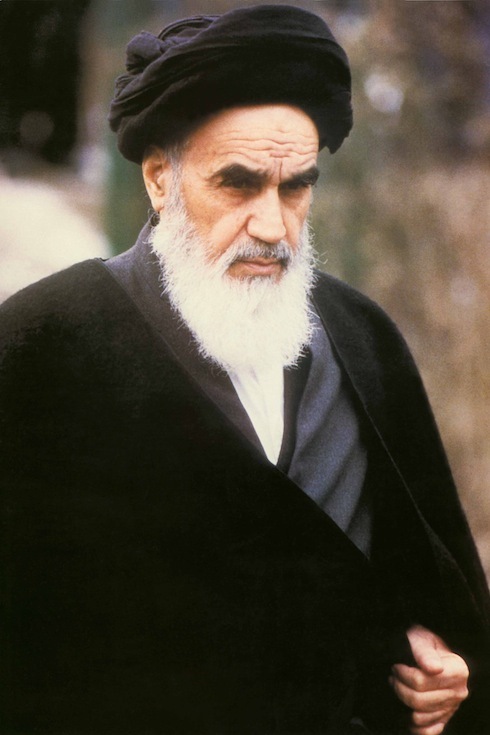 The 1979 revolution, which had overthrown the Shah and established an Islamic republic, had made Tehran the capital of Muslim radicalism, and Ayatollah Khomeini its spiritual leader. Yet Tehran’s attempts, in the following decade, to broaden the Islamic revolution had made little headway. It had failed to destabilise the deeply conservative Saudi regime or to loosen the Saudi grip on the direction of Islam worldwide. It had also been forced, in 1988, to abandon ingloriously its bitter and bloody eight-year war against Iraq, and with it its hopes of bringing down Saddam Hussein… Inside Iran, Khomeini was facing increased opposition from reformers such as the speaker of the parliament, Ali Hashemi Rafsanjani, who had condemned the ‘shortsightedness’ of Iranian foreign policy for ‘making enemies without reason’ and was pushing for improved relations with the West. The fatwa sowed confusion and division among supporters of the Saudi regime. A number of militants who had taken part in the Afghan jihad against the Soviet Union and who had been within Riyadh’s orbit now pledged allegiance to Teheran – among them the Egyptian Sheik Omar Abdel Rahman, who is currently serving a life sentence in America for planning to bomb the World Trade Centre in New York in 1993. Inside Iran, the fatwa stopped in its tracks attempts to improve relations with the West. The reformers were forced to denounce Rushdie, Rafsanjani describing the publication of The Satanic Verses as ‘an organized and planned’ plot involving the intelligence services of Britain, France, Germany, the United States – and certain ‘Zionist publishers’. The fatwa helped transform the very geography of Islam. Under traditional Islamic law, no fatwa could be valid outside those areas in which sharia law applied. Muslims may have emigrated to Britain or converted in India, but a fatwa could have no validity there because these states were not under Islamic authority. With his four-paragraph pronouncement, the Ayatollah had transcended the traditional frontiers of Islam and placed the whole world under his jurisdiction. At the same time he helped relocate the confrontation between the Islam and the West, which until then had been played out largely to the Middle East and South Asia, into the heart of Western Europe. For the West, Islam was now a domestic issue. And so began the infamous Danish cartoons controversy. Except that it didn’t – at least not straight away. The publication of the cartoons caused no immediate ructions, even in Denmark. About a week later, not having created the furore they had hoped for, journalists contacted a number of imams for their response. The cartoons had simply not registered with Muslim leaders, but once the journalists had pointed them out, they quickly recognised the opportunity provided not just by the caricatures themselves but also by the sensitivity of Danish journalists and politicians to their publication. Among the first contacted was Ahmed Abu Laban, infamous for his controversial views on Osama bin Laden (whom he called a ‘businessman and freedom fighter’) and 9/11 (‘I mourn dry tears for the victims’, was Laban’s response). Described by the Danish press as a ‘spiritual leader’, he was in fact a mechanical engineer by trade, and an Islamist by inclination. Having been expelled from both Egypt and the United Arab Emirates because of his Islamist views, he had sought refuge in Denmark in 1984. There he became leader of the Islamic Society of Denmark, an organisation closely linked to the Muslim Brotherhood. It had a novel way of swelling its importance. It declared that all Danish Muslims were members, irrespective of whether or not they had actually prayed on the dotted line. In reality, fewer than a thousand worshippers nationwide attended the Society’s Friday prayers. Abu Laban seized upon the cartoons to transform himself into a spokesman for Denmark’s 180,000 Muslims, demanding an apology not just from the newspaper but from the Danish Prime Minister, too, and organising a demonstration outside the offices of Jyllands-Posten. Yet however hard the imams pushed, they could not provoke major outrage either in Denmark or abroad. Three days after the Copenhagen demonstration, the Egyptian newspaper Al Fagr republished the cartoons. It was accompanied by a critical commentary, but the newspaper made no attempt to blank out Mohammed’s face. (When the British liberal magazine Prospect republished one of the cartoons to illustrate an essay I had written about the affair, the Prophet’s face was left blank, so as not to cause offence.) Neither the Egyptian government nor the country’s religious authorities raised any objections to Al Fagr’s full-frontal photos. In the very week in which Al Fagr had republished the cartoons without official censure, the Egyptian ambassador to Denmark joined nine other Muslim diplomats to request a meeting with the Danish Prime Minister Anders Fogh Rasmussen, and to demand that he distance himself from the caricatures. Rasmussen refused to meet the ambassadors, claiming that to do so would infringe the freedom of the press. At the beginning of December 2005, the Organisation of Islamic Conference (OIC) held a summit in Mecca. 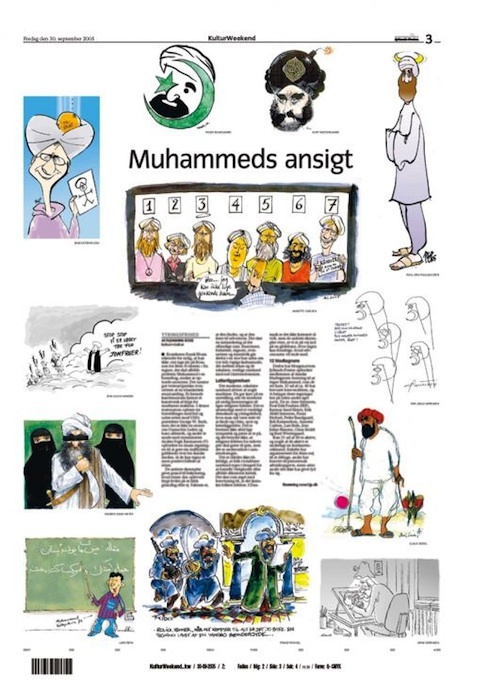 A group of Danish imams compiled a forty-page dossier about the cartoons to circulate to the delegates. The dossier consisted of the original 12 cartoons, pictures from another Danish newspaper, Weekendavisen, that were ‘even more offending’ (they were in fact parodies of the pompousness of the Jyllands-Posten caricatures), hate-mail sent to Danish Muslims, and letters from Muslim organisations explaining the case for censorship. Also in the dossier were three other pictures that had nothing to do with Jyllands-Posten but at least one of which was reported on the BBC as having been published in the Danish paper. It showed a man with a pig mask, and was widely taken to be an offensive depiction of Muhammed himself. In fact it was a photo taken at a traditional pig-squealing contest in France; there was no connection to Islam. The imams later claimed that it had been sent to Muslims taking part in an online debate about the cartoons and was included as an illustration of the ‘Islamaphobia’ under which Danish Muslims lived. The OIC summit condemned the cartoons and demanded that the United Nations take action against Denmark. Like the Rushdie affair, the controversy over the Danish cartoons was driven not by theology but by politics. 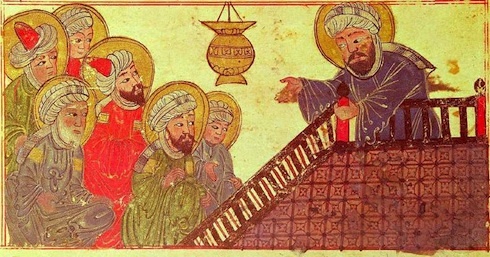 The Islamic art historian (and member of the Jordanian royal family) Wijdan Ali has shown that, far from Islam having always forbidden representations of the Prophet, it was perfectly common to portray him until comparatively recently.The prohibition against such depictions only emerged in the 17th century. Even over the past 400 years, a number of Islamic, especially Shiite, traditions have accepted the pictorial representation of Muhammed. The Edinburgh University Library in Scotland, the Bibliotheque National in Paris, New York’s Metropolitan Museum of Art and the Topkapi Palace Museum, Istanbul, all contain dozens of Persian, Ottoman and Afghan manuscripts depicting the Prophet. A 17th-century mural on the Iman Zahdah Chah Zaid Mosque in Isfahan in Iran shows a veiled figure of Mohammed; through the veil, his facial features are clearly visible. Even today, few Muslims have a problem in seeing the Prophet’s face. The Iranian newspaper Hamshahri, which, in response to the Jyllands-Posten caricatures, launched a competition for cartoons about the Holocaust ran, at the very time it was campaigning against the Danish cartoons, a photo of a mural from a contemporary Iranian building that depicted Mohammed on his Night Voyage. When Al Fagr republished the cartoons, it did not think it necessary to blank out Muhammed’s face, and faced no opprobrium for not doing so. The paper might have been critical of Jyllands-Posten but it certainly was not obsessed with the idea that the Prophet must remain unseen – and neither were Egypt’s religious and political authorities. It took several months of dedicated, and often hysterical, campaigning to generate an international storm. I am astonished that Kenan is ever *not* blocked in China. Surely they have bot’s that kind find the words “Free Speech”. Kenan, a good article as always but the only part I might disagree with is your description of Braford as a ‘small northern town’, whereas if you had said a vibrant northern city with a population of 600,000 that would have been acceptable. As it happens on the day of the anti-Rushdie march in Bradford I just happened to be there, in fact that was the reason that I was there. At the time I was a serving police officer and had taken a contingent to Bradford from from Leeds 11, very close to where the 7/7 bombers both lived and carried out their planning. We had been warned to expect several thousand marchers but in the event the number was in the regiuon of 700 most of whom were bussed in from towns across West Yorkshire. As they de-bussed they were handed poles (brush handles) to which had been fixed placards mostly bearing the legend ‘Death to Rushdie’ and ‘Burn the Satanic Verses’. The first task was to advise the marchers that if they attempted to march carrying placards which were in fact making threats to kill they would be arrested – we had no dissenters. Talking to many those present the vast majority had neither heard of Salman Rushdie nor The Satanic Verses and as was pointed out to me on more than one occasion they could not have read it anyway because they could not read English. After a couple of speeches, one in particular by a young Iranian who had been sent from Tehran to the UK via the Gulf and had travelled nationally to whip up some anger, we escorted the march on it’s travel around the Bradford inner ring-road. In the final analysis it was in reality a non-event. Yes, people were allowed to protest, they were not allowed to carry placards making threat to kill, attempted break-aways by the juveniles present to break through the police cordons and cause a bit of havoc in Braford City Centre were prevented because one of my officers, who was Asian and spoke several languages, provided sufficient intelligence to allow us take relevant action. It was a fine sunny day, we enjoyed a pleasant walk around Bradford and there were two arrests in the city centre for minor public order offences and those participating in the march became very bored. Fascinating account that rather backs up the thrust of the article. 1) They need a name to make it sound like there are more of them, say, “bolshevik” or something like that. Yes, except of course that the inciters have *created* a connection. This artifical connection is politically important: large sections muslim populations will judge their politictians by how harshly the condemn the film. terrorists have successfully hammered on a wedge. We can try to blunt the loss by agreeing that free speech does not extend to upsetting terrorists. Or we can just accept that we have lost this battle, the real fight is a long one. Very very good read. I dropped here from Jesus and Mo website, and am glad that I did.